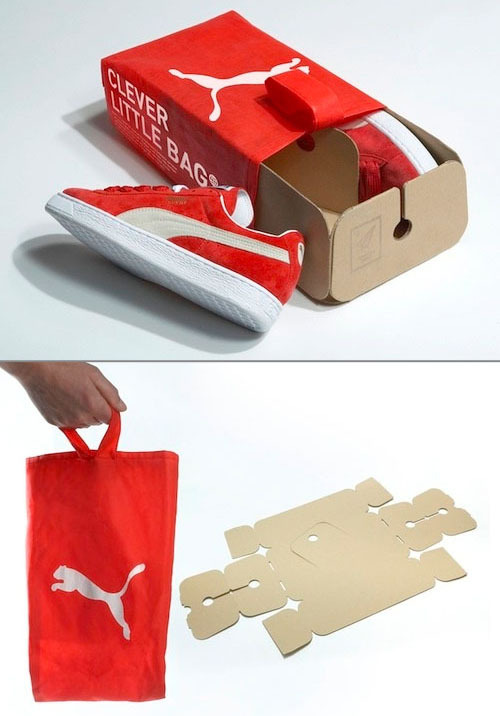 Puma recently worked with designer Yves Behar to redesign the shoebox from scratch, resulting in the aptly named "Clever Little Bag." It is (or at least seems to be) green in the best ways, taking into account the supply chain and real origins and destinations of the materials; it reduces cardboard by 65%, eliminates recycling-unfriendly glossy printing, and features a reusable bag which is stitched with heat for manufacturing efficiency. Puma projects savings of water, energy, and fuel - not just post-consumer waste (the stuff we users throw away), the part of the cycle that gets the most attention. If you want to learn more, the video on Puma's site is only a minute and a half long, and definitely worth watching. Well done, Puma and Yves - reinventing a mature product is never easy, but often just this worthwhile!